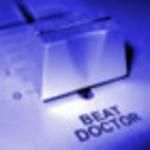 The original idea behind the Beat Doctor project was to combine 21st Century house sounds with old skool sounds and a slightly minimal feel. The trademark Beat Doctor sound emerged in late 2005 with synth based electro house remixes of "Twist Turn Slide" (originally by Psychadelik Pedestrian) and "Push It Down" (The Toucan), and this style was taken into Beat Doctor's 2006 tracks. Sidechaining also became a signature of the Beat Doctor sound, used in John's most recognisable Beat Doctor tune of 2006, "Intermission". In 2007, Beat Doctor remixed some classic Toucan tracks including "Pump It", "Your Smile", "Jumpin'" and "Move Harder, Move Faster", and also some new tracks including what has become the best known Beat Doctor mix to date, the remix of "Memories of Thailand" by Risey, which featured a more commercial electro club sound. Beat Doctor continued this sound into 2008, with tracks such as "The Piano Tune" and "Organic", though a change in direction to an electro rave influenced sound was evident first in "Bad Man", and then "Too Retro" and "Lost The Plot". This sound has developed further into 2009 with the remix "Far Too Retro".